In the vein of horror master H.P. 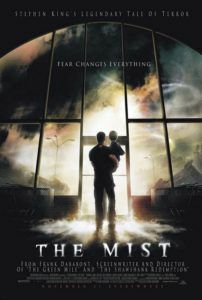 Lovecraft, Stephen King’s The Mist involves horrible, slimy things obscured by the unknown. We begin in a Maine town the day after a powerful electrical storm, when a vast mist rolls in from the mountains, consuming everything. The few dozen survivors who hole up in a grocery store soon realize something is in the mist. What that something is remains indefinable, since King’s story is less about monsters than the human monster: a simple, primal creature capable of unspeakable horrors when their logic for explaining the universe is challenged. Thomas Jane plays David Drayton, a family man and painter of movie poster art. 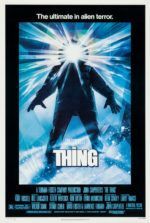 Before the mist fiasco begins, on his wall we see a framed piece of original poster art from The Thing, John Carpenter’s masterpiece where, expanding from Lovecraftian archetypes, creatures are brought from out of the darkness, showing their gory tendrils and bloodily morphing parts. The mist hides those unnamable, other-worldly things, distorting and hiding their already vague threat. Later, Drayton and his son Billy (Nathan Gamble), protected from the outside by the supermarket structure where they’ve taken refuge with several others, are subject to much worse horrors inside the store walls. David’s skeptic neighbor Brent Norton (Andre Braugher) doesn’t believe there’s anything out there, since all but one of the survivors were already in the store when the mist arrived. And then Dan Miller (Jeffrey DeMunn) comes running, his nose dripping blood, telling of how he witnessed a friend taken, by something, into the mist. People are afraid enough of the unknown to not leave the supermarket, but they dismiss Miller’s more horrific claims. Norton attempts to convince everyone that the mist is not super-natural, that it’s either man-made or just a freak natural occurrence. In doing so, he gains a few followers. While separated from the group in the loading dock, David and three others, including clerk Ollie Weeks (Toby Jones, whose character burgeons from your average cash register jockey into a full-fledged hero), witness a stock-boy ripped apart and dragged into the mist by anonymous tentacles. To what massive creature do these tentacles belong? Impossible to tell, but there’s certainly no going outside. What’s more pressing is how David must convince a crowd of people, frightened beyond understanding, that something so fantastic just happened. In contrast, Norton’s logic sounds plausible. Even Mrs. Carmody (Marcia Gay Harden), the town’s religious fanatic, has a more concrete explanation: that this is the End of Days, that God has once again become wrathful, and now calls on sinners for retribution. Her solution: expiation, which translates into human sacrifices to the mist. Mrs. Carmody’s fervent religious extremism is laughed off at first, but when her pseudo-prophesies happen to play out, she gains followers. Lots of them. 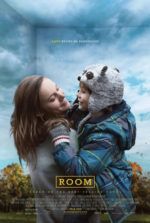 Harden’s performance makes Mrs. Carmody’s every word believable and paranoid, spoken with an inflamed passion that frightens us enough when it’s just her, but even more so when others follow her words. Harden reminds us why she has an Oscar. David’s group not only defends against encroaching monsters from the Great Beyond, but also the quick growth of religious hysteria booming inside the store. As Mrs. Carmody gains believers, her sect begins to control the decisions made for the entire group. A survival story becomes a tale of how people, faced with the unknown, distance themselves from one another with religion and politics and belief systems that are otherwise meaningless. 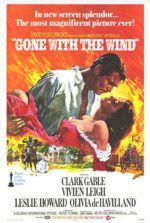 In his previous work, Frank Darabont, the writer-director behind superb King adaptations The Shawshank Redemption and The Green Mile, worked in a temperate, moderate-paced filmic tone. For years, his dream had been to make an adaptation of King’s The Mist, a novella appearing in the anthology Skeleton Crew. With the realization of that dream, his as yet austere filmic disposition disappears and is replaced with the moves of a fierce horror director, one with an understanding that humans, not monsters, drive this story. As a result, we’re often more horrified by what people do to each other than what terrors lurk in the mist. With Darabont’s version of King’s story, mini-societies among the survivors are wonderfully outlined and segmented, as if they were test subjects burdened by confined space and a conflict-resolution situation. With absolute care and respect for his characters, even if working within long-established horror story tropes, he depicts an affectingly terrifying and dismal situation. Darabont raises his film to the level of The Shining, Carrie, Misery, Stand by Me, and indeed his own adaptations, as one of the best King book-to-film stories. Having read the novella at a young age—perhaps too young, as I think back now—I had expected the same anti-climactic finale King provides. But the director’s version concludes more fittingly, I believe, than King’s text. Instead of glorifying the remaining survivors as pseudo-heroes facing the unknown, Darabont provides a wicked, grim conclusion, worthy of the sad sentiments on humanity put before it. I applaud the director for those final scenes, as they were the most shocking dramatic moments in a horror movie I’ve seen in years. The Mist suggests that human nature represents an abysmal void, filled with monstrosities of sorts, and that humanity compensates for that by pretending we’re civilized. Ultimately, the film offers up the idea (a frequent one in Stephen King stories) that humanity is generally cruel, and that people, at their roots, are savages. King’s mist exists in the realm of our obscured self-understanding as a species—confused, ambiguous, and filled with horrible possibility. Our desire to control and explain the unknown results in religious fanaticism, suspicion, and hysteria, which leads to blindness, fear, and violence. All the film’s characters risk their sanity by trying to reason themselves out of a wholly incomprehensible situation, but there is no such thing as reason, the story asserts, other than in the often grotesque ways we invent it for ourselves.